Our Fall Reunion begins on October 9, 2012 with the conferral of the Fourth Degree following the monthly stated meeting. Our degree directors and degree casts are beginning their preparations and the lodge room will be busy with practices and dress rehearsals throughout the months of September and October. Take a moment to think about the devotion of the many Brothers involved in the conferral and communication of the degrees. Because of the hard work and dedication of these Brothers our fall Reunion will be one we can all be proud of. I encourage you to attend all degree conferrals to show your support of the new class and your Brothers presenting the degrees. Your presence is vital to the success of the reunion. The Masonic Restoration Foundation (MRF) held their third annual symposium on August 23 - 26 at the Oakland Scottish Rite Temple. I hope some you had the opportunity to attend. The four day event hosted by Academia Lodge No 847 included scholarly papers, the conferral of the Fellow Craft Degree in Traditional Observance Lodge manner, a Lodge of Instruction and several great dinners including a formal agape. 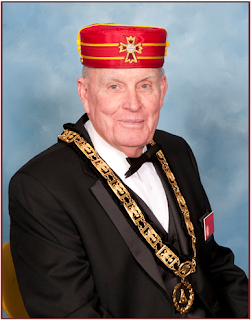 Closing remarks on Sunday, Aug 26, were made by Very Worshipful John L. Cooper the Senior Grand Warden of the Grand Lodge of California. A few words about the MRF are probably in order for those of you who might not be familiar with the organization. Since 2001, the MRF has been conducting research on the problems affecting American masonry, identifying successful practices and offering realistic solutions aimed at reversing negative trends. The MRF have interviewed hundreds of young men about their perceptions of Masonry and what they seek in the lodge experience. They are aware that many young men who are joining the fraternity today have generally already done a lot of reading and website surfing and have formulated an opinion about the fraternity. Most of these young men perceive Freemasonry as a place for truth-seeking, a way to seek self-improvement and realize spiritual development. These young Brothers know what they want from a fraternity and have high expectations that their lodge will meet their needs as men. The MRF provides education and training to individuals, lodges and Grand Lodges on ways to establish quality programs, academic excellence and social relevance in their Masonic communities that will be a match with the needs of the new Mason. In addition, the MRF provides certification for lodges seeking to become a traditional observance (T.O.) lodge. The MRF has established requirements and tenets for a T.O. lodge to follow which affords the lodge the opportunity to establish an initiatic focus and Masonic culture dedicated to the preservation of traditional forms practiced by our ancient masters. If the objectives of the MRF appeal to you I invite to visit www.traditionalobservance.com to learn more about how they can assist you and or your lodge. Next month I am going to discuss a few ideas about “sacred space” and our Masonic temples. I look forward to seeing you at the September 11 Stated Meeting and Dinner.